A lot of basic skills that were once common knowledge are now deemed old-fashioned or unnecessary, but we shouldn’t be so quick to discard them. If we took the time to learn how to do more for ourselves instead of paying someone else to do it, then we’d have more money and a greater sense of accomplishment that can’t be bought. 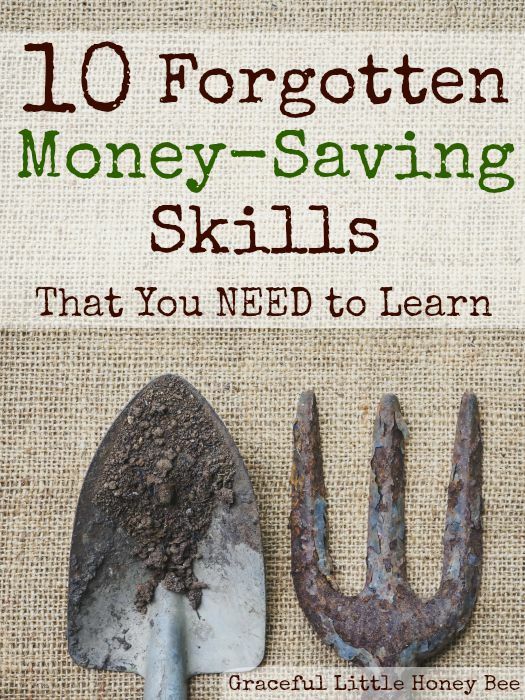 I personally practice a lot of these skills because I think it’s good to know how to fend for yourself if the need arises, and did I mention that they will end up saving you money? 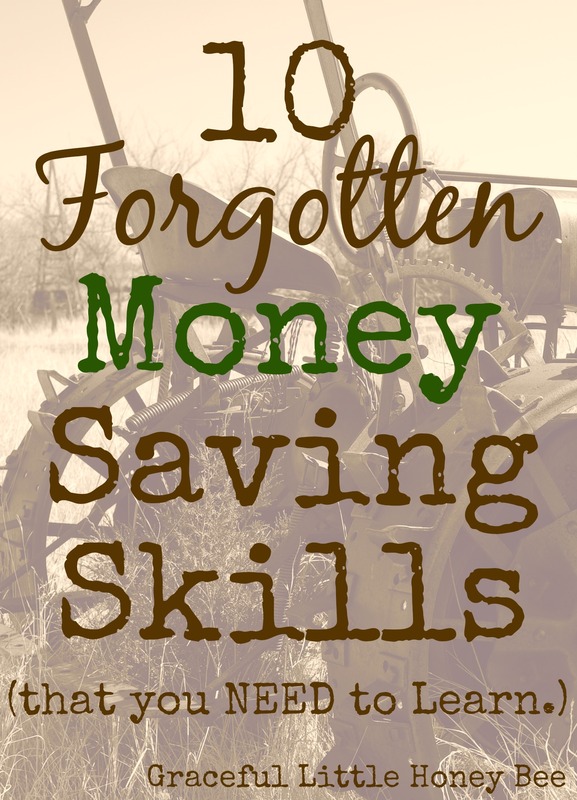 So here are my top 10 forgotten money saving skills (that you need to know now). You can potentially get hundreds of tomatoes from one $2 packet of seeds, but how many tomatoes will that same $2 get you from the store? Gardening is a great way to save money if you can keep costs down by growing plants from seed and using natural soil amendments like I talk about here. If you’re new to gardening then you can also check out my top 5 Tips for Beginner Gardeners. Foraging is something that our ancestors knew way more about than we do today. If you don’t know, foraging is when you find food that is growing wild like picking berries on a roadside or dandelion greens in your backyard. I wish I knew more about this lost skill, but sadly my knowledge is limited. The best way to safely learn about identifying nontoxic edibles is to sign up for a local class or take a course on the subject. You could also find books from your local library, but I’d be leery of relying on photos alone as a lot of edible plants also have toxic look a likes. Our culture is so used to spending money that bartering isn’t even on most people’s radar and I think that’s a shame! Bartering is when you trade your skills, time or goods for someone else’s. For example, I could crochet someone a hat in exchange for a couple of hours of babysitting or I could trade some of my surplus garden produce for piano lessons. Think about how much money you would save if you put this into practice more often! Since clothing is so cheap and plentiful these days, sewing handmade garments is normally more expensive than buying off the rack, but having basic knowledge of mending and tailoring can save you tons of money. I don’t know how many times I’ve extended the life of my families clothes simply by sewing on buttons or mending seams. While my family doesn’t hunt or fish much, plenty of our friends do and I think it’s a wise skill to have in case you need to provide for yourself one day. Also, store-bought meat is expensive and being able to kill your own is a huge money saver! What would our ancestors have done without dear, wild turkey or fish to keep them going? Keeping a few chickens may not save you much money, but in most cases the cost of feed versus the cost of eggs/meat evens out. You can keep costs down by letting them free range and by feeding them your kitchen scraps. You could also collect scraps from friends or local restaurants to feed to your hens, but make sure they are getting mostly whole foods such as vegetables, grains, etc. Paying cash definitely seems like an old-fashioned skill these days, but it’s a great one to keep alive! Did you know that people tend to spend more when they use a card verses paying cash? Also, you can normally talk someone down on price when you have cash in hand. Did your TV break? Go buy a shiny new one and put it on the card! Did the car break down? Trade it in for a new one and pay for it later! It seems like our culture tells us we deserve everything instantly, but by doing so we’re missing out on valuable life lessons such as patience, resourcefulness, hard work and gratitude. Not to mention that delaying gratification allows you to avoid paying interest and save even more money. The next time you want to buy something, ask yourself if you can find it cheaper, make it yourself or simply go without. Which of these skills do you practice to save money? Do you have anymore to add? I’d love to know! I think there is way more than just 10. This past year we started our home remodel. I think many are real quick to hire a contractor. While we are more of a lets get our hands dirty. Which leads to another sort of Salvage what does or doesn't need replaced. We redid the deck replace the top but not the intact beams and joists. Maybe I can use the old deck for exterior landscape. In general I think people have forgotten that some wants are not needs. Our first home was build in 1955, we bought in 2004 from the original owner who had raised 4 children in a home that was only 1050 sqft. I think our generation feels that they need more space when previous generations were satisfied with the space they had. For years, my wife and I were buying new cars, but not any more. My philosophy now is why have to pay to have a car worked on that you are already paying for. We have had several vehicles that we watched get towed away that we were making payments on. Even when the work is under warranty that is a sad feeling. Especially when you are paying good money on it. Hunting, at least in Pennsylvania, does not save money, unless you do the butchering yourself (another valuable, long-lost skill). Butcher's charge more per pound than than you would pay for beef in the grocery store. And you provide the meat. The only tip I disagree with is paying cash. I opened a credit card early this year that pays 1.5% cash back. I pay most of my bills with it. I buy groceries, gas, and just about everything with it. Then I pay it in full every month. If you don't pay in full every month and have to pay interest, then it's probably not worth using. But for someone who is a responsible bill payer, it can really pay off. I now have built up over $300 in rewards.